So the Fed honored our prediction from last night and gave no indication of launching QE3 in 3D: The Revenge, but today announced "Operation Twist." Under Operation Twist, future Fed market actions will be decided over a friendly game of Twister, to be held in Ben's basement on alternate Tuesdays. If things get really bad for the economy, they have left open the option to stretch the game out over two days, although some of the Fed governors will then play using pre-designated "stand-ins." Under the "Loser Buys Drinks" provision, Jello shots will be provided by the taxpayers. Or if you want to read what it's really about, you can do that here. Quite frankly, I don't have time to read it: I'm too busy preparing Jello shots for the Boyz. Besides, when I read stuff like that, my eyes start to itch excessively whenever I get to phrases like: "the Committee decided today to extend the average maturity of its holdings of securities. The Committee intends to purchase, by the end of June 2012, $400 billion of Treasury securities with remaining maturities of 6 years to 30 years and to sell an equal amount of Treasury securities with remaining maturities of 3 years or less." After a few paragraphs, it starts to seem like the words (and the ideas behind them) would make about the same amount of sense no matter which order they were in: "The Committee decided today to extend the average holding of its mature securities." or "The Committee decided today to average the extended maturity of its securities of holding." or "The Committee decided today to extend the average maturity of its members by 6 to 30 years." After reading a whole page of that crap, I'm ready for a beer. I get the same feeling whenever I read the fine print in product warranties. The bottom line appears to be more of the same from the Fed... and it seems to me that "more of the same" won't be nearly enough to keep this market elevated in bubble-mode. Which, as I said last night, is pretty much what I see in the charts. The market sold off heavily into the close, which most traders are probably looking at as "big deal, we're still in the range." 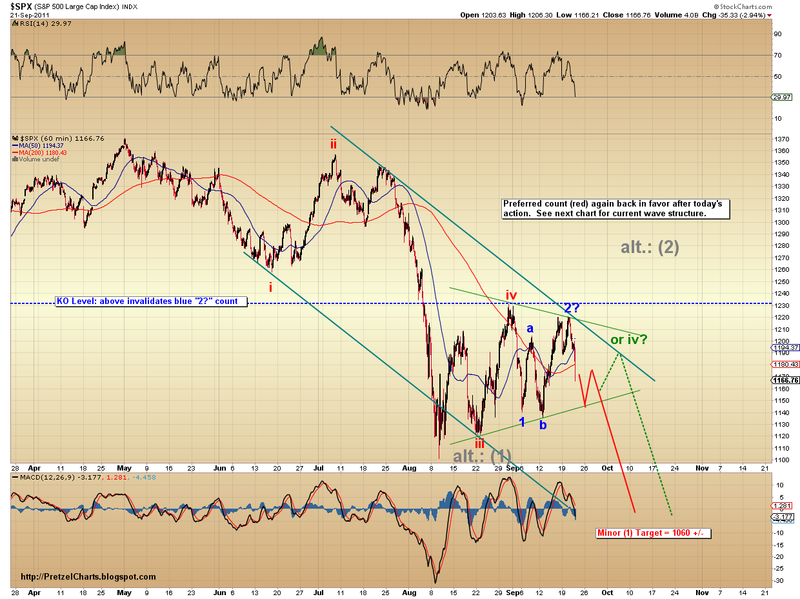 If I'm reading the charts right, I think this is the move where we finally breakdown. 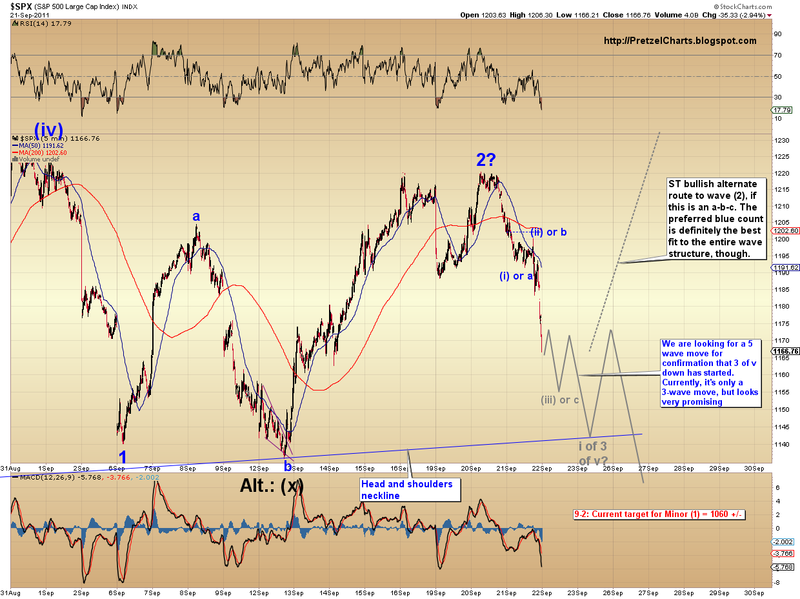 The recent rally and preceding moves count very, very well as an a-b-c (see chart). So well, in fact, that in the context of the moves which preceded that, any other labeling is a stretch. Is it possible something else is going on? Sure, it always is. But my best analysis, and my gut, says the preferred count we've stuck with for several weeks is going to emerge victorious in the end here. So, if my analysis is correct, we may finally see a breakdown from the bear flag/head and shoulders in the very near future. What happens tomorrow may give us our answer, because the move down still hasn't formed a complete impulse wave yet. Futures are flat as I type this. If it doesn't go on to form a complete impulse, we'll have an immediate clue that the preferred count may be in question... and I'll be eating crow and/or Jello shots in tomorrow's post. 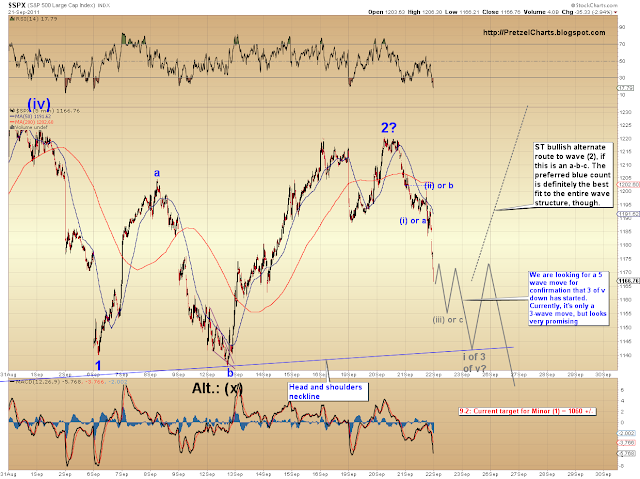 Enjoy the blog and the EW and other TA! Curious to see the latest analysis after the bashing the market took today! Thanks for sharing and good trading!